This time of year, everyone has lots of questions about the IRS Special Enrollment Examination. That’s why I hold a session – and record it – to explain the most important aspects of the Exam, and what you need to know if you’re going to be studying to become an Enrolled Agent. If you missed the session on April 20th, you can watch and listen to the replay right here. Or you can download the MP3 file. 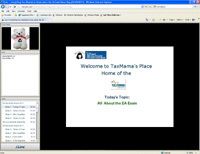 There is information about the Enrolled Agent (EA) Live Class TaxMama teaches. You will also find the Course Schedule on that page. There is information about the Enrolled Agent (EA) Self-Study Course TaxMama teaches. There is information about the materials used in and provided with the class. There is information about the course prices. There is information about the Enrolled Agent (EA) exam itself. If you’re not really sure what an Enrolled Agent is, there’s information about that. We even show you what students have said about the class! And if I haven’t answered everything, well, there are FAQs for you. This entry was posted in *AskTaxMama Newsletter, *Education and tagged *Education, csea, EA, EA Exam, Enrolled Agent, Internal Revenue Service, IRS, NAEA, Office of Professional Responsibility, opr, see, Special Enrollment Examination, TaxMama.